I recently emailed with Martin Bower, UK-based model-maker extraordinaire. This man's IMDB page doesn't do him justice. He's worked tirelessly in the film industry as a model-making wizard. You've seen his work time and time again, even if you didn't know it. But he can talk about his new model-making magazine, a bit about Ray Harryhausen, and why he still prefers to spell things the British way. Which, let’s face it, is a nice refreshing change of pace for those of us stateside. While he's busy making promotional rounds, I wanted to give him the chance to say what most interviewers choose to edit out. To me, that's the good stuff. The best stuff. And it's all right here. AB: I first met you when I was searching for Bolaji Badejo, the man in the Alien suit from Ridley Scott’s "ALIEN". I know that’s the work you're asked about most, and you’ve told me before that everyone cuts you off (or edits you out) when you have things you want to say about it. Here’s your chance! What was your most memorable experience on that film? MB: Well, I think for me, my most memorable experience, perhaps a little unfortunately, was Ridley Scott coming over to re-shoot all the miniature SFX and taking a hammer and chisel to the Refinery towers, and hacking whole sections off. 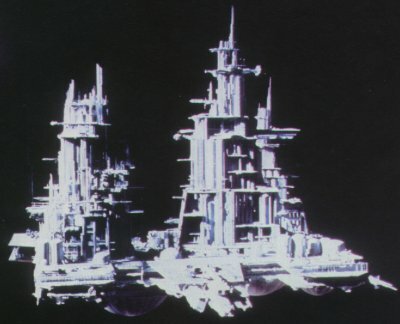 For example, the engine room set and getting us to add two of its towers as extra jets to the back of the Nostromo Tug. For the purposes of this interview I will refer to the Tug/lander as Nostromo and the platform as The Refinery, since this was the way they were referred to in the making of the film, regardless of what it says ON the screen at the beginning. AB: Often times, I won’t even know that a friend of mine is into model-making until I visit their home and find that their office is filled to the brim with reproductions of battleships and spacecraft and Warhammer figurines. The people I know who are into those things are just generally quieter about it. Do you find this to be true of most model enthusiasts? MB: No, not at all. But maybe it’s just the people I know. Many of my friends are into model making, and the amount of magazines out there on model making are quite phenomenal! Indeed, in the early 1990’s when I made Model Making Technique Video Tapes, I sold around 400 to 500 of each title, and that was just in the UK alone as I could not have them converted to the American NTSC format. Also I get anywhere between 30 to 40 e-mails a week asking me specific questions on how to do certain modeling techniques. It’s a huge hobby, but I must make it clear I’m talking about Sci-Fi and Fantasy models as opposed to “Railway Modeler’s Weekly”. AB: Out of your many creations, some are well known sci-fi pieces, like your work for “Flash Gordon” and “Dr. Who”? But what do you think would surprise people about some of the work you’ve done, or the genres of media in which you’ve been involved? Mine was very skeletal and sharp, with hints of a pterodactyl. I have also made dinosaurs for him and done creatures for a channel 4 documentary called “ET Please Phone Home” where I diversified into creature making. I also built a galleon for the BBC TV series “THE GREAT PALACE” about The Palace of Westminster and how it has changed over the centuries… but film and TV modelling is far and away my favourite type of work because I (usually) get the chance to do the designing of the craft myself, as in “Space 1999” where at the age of only 20 I was given an almost free hand to build the 84 models I built for the show. I am forever indebted to the show’s SFX Supervisor, Brian Johnson, for this. AB: Did you always intend to make models, or was it a happy accident? Because you seem remarkably passionate about it for someone who has been involved for so long. So many professional creatives seem to burn out. MB: I’ve ALWAYS made models! I knew from my earliest recollections that I wanted to be a Special Effects model maker; not just a model maker, but that particular type of model maker. My earliest recollections were of me making Balsa wood models of Supercar, which was one of my very first real inspirations. I was 7 or 8 when that came on TV. People (my Mum and Dad) said I’d grow out of it, but as you can see, I haven’t. I know the guy doing my website counted that I’d made 1022 professional models; I wonder how many I made before that?! AB: Okay, file this one under, “I’m sure you’ve been asked this a thousand times”, but do you think that Computer Generated Effects are taking a lot of your work, or do you believe that model-making will always have a place in film and television? Or both. MB: Yes, you’re right I have been asked this many times before! And the answer is YES I do think all of us “Proper” model makers, (by that I mean 3D model makers) have lost out to CGI. But I think there is a place for both. I mean Gollum in “Lord of the Rings” is FANTASTICALY realistic, but they had (I’m told) 47 people working on him alone. 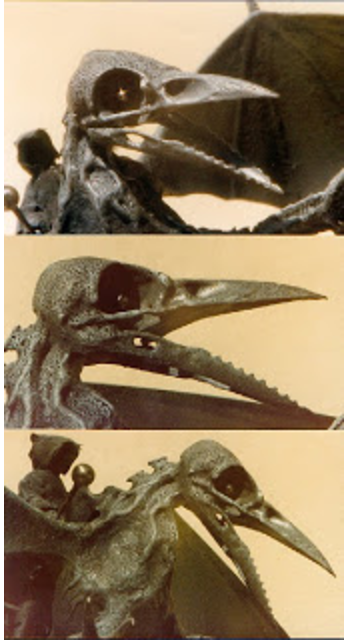 Ray Harryhausen made and photographed fantastically realistic creatures ON HIS OWN and at a fraction of the cost. Personally, I think the example of how it should work is shown in “APOLLO 13”. It combines a 25 foot high model Saturn 5 rocket with CGI effects such as the ice falling off the liquid oxygen tanks added afterwards to give realism. I don’t know whether it’s just me but 90% of CGI models are obvious as CGI models, but they are getting better and better all the time, so I’m really not sure what the future holds. But I do make a great many models for collectors, and also do work for the “Giftware” Industry. People want something they can hold, something that’s tactile, and it’s the same with me. I’m not interested in tweaking a computer, I want to carve a piece of wood and get clay under my fingernails. AB: Typically, where do model-makers fall on the hierarchy of a project? Do you usually experience some freedom with your creativity? MB: Well, it varies, but I do tend to get more control than some others (and please don’t take this as me being big-headed) but I have been gifted with a fair amount of “design sense”. For example: by the last few months on “ALIEN” time was running out and I found myself talking directly with Ridley Scott. He said he didn’t like the way the clamps holding “Nostromo” to the refinery were done. So he demonstrated with his hand how he thought “Nostromo” should be pushed away and released like a giant hand. So I went and did a quick drawing, which he approved, and off we went and built it. But it doesn’t often happen like that. On “Flash Gordon” we had to stick rigidly to the art department’s drawings, so I had no design say whatsoever. 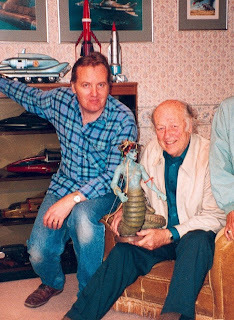 AB: Can you talk a little bit about your interaction with Ray Harryhausen? MB: Yes, (during “Alien”) I’d gone to a pub in Fulmer near Pinewood Studios, with a colleague to drown our sorrows as two technicians at the studios had just dropped a huge greenhouse section of the “OUTLAND” Refinery we’d just spent the last 4 months building. So maybe I wasn’t concentrating; but suddenly these two guys got up to go and I realised it was him! The accent (he still has his real Texan drawl) the look, it all fell into place. I’d been literally sitting next to him all that time without it “clicking” that it was Ray. It was 6 years later at “WORLDCON” in 1986 in Brighton that I actually met him properly. As fate would have it Jan, my wife, and I were seated right next to him and I had a model with me (as I knew he’d be there as we were both guests) of the Sphere from his film of H.G.Wells “First Men in the Moon”. I made myself known to him and showed him the model, and we just hit it off straight away. Diana, his wife, got talking to my wife and the upshot of this meeting (which to this day I still think was ordained) was that I wanted to give him the model as a sort of “thank you” for all the pleasure his films had given me over the years. But it’s a mark of the man that he insisted he pay me to make one for him. And that was the start. 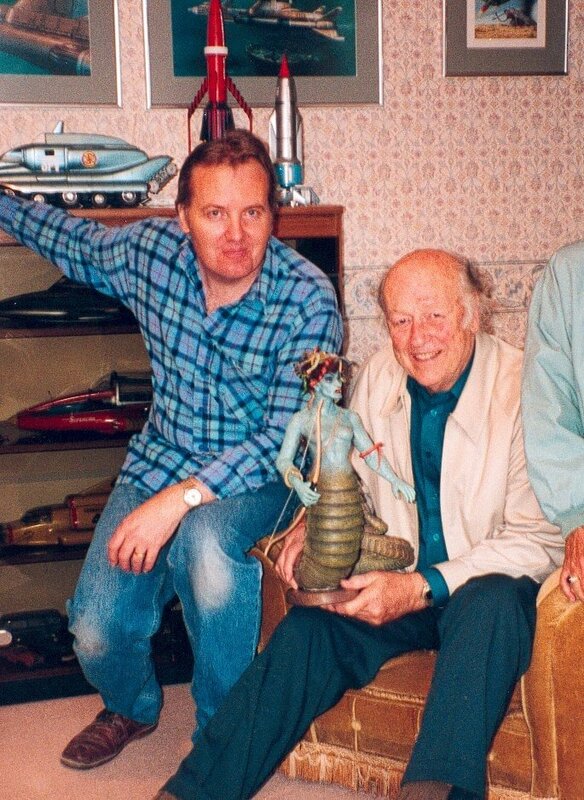 I went on to work with him, not on his films but making fibreglass copies of his rubber armatured actual film models. I also built the top of the Empire State Building for his model of King Kong to hang onto. Well many of his models had sadly suffered over the years, as latex is not very stable, and so it came about that I ended up having to copy his actual film model and often re-sculpt it, (as in the case of Medusa) but this time taking a silicon rubber mould from the plastilene model I’d copied from his original rubber model, and then making it in fibreglass so that the models would last whilst on display at M.O.M.I. (The Museum Of the Moving Image) And that was how I came to know him. My wife and I went to his house in Kensington in London and he came down to greet us in this woolly cardigan with holes in his sleeves, and my wife said, “just like you!” to me. (I’m known for my fashion sense.) Anyway, to my intense delight he took me up to his work room, which is right at the top of this 4 storey house, and there were all these models I knew and loved. I’d just like to say that in 1995 I was chairman of the Bournemoth Sci Fi and Fantasy Group and they were always trying to get guests to come down. Anyway, I flippantly said “I’ll get Ray to come down” and they all said “oh yeah, pull the other one (or words to that effect. Anyway a few weeks later he and his wife (who is David Livingstone’s Grand Daughter, by the way) arrived in their car, stuffed full of models and he stayed overnight at our place and gave the talk the next day. And I think it is a mark of the man that not only would he not accept a fee for doing the talk, but he wouldn’t even let us pay for his petrol! AB: Wow, that's like every geek's fantasy. I guess my equivalent would be like promising I could get Harrison Ford to come to my Christmas party, and then him showing up and bringing props from the Indy films. 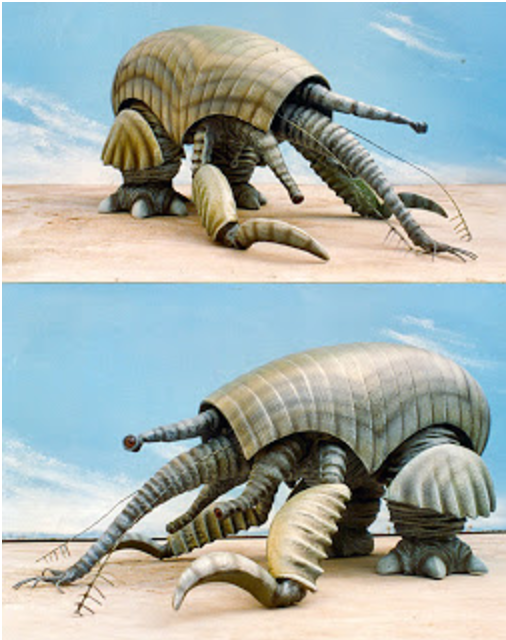 Speaking of geeking out, can you name a model that you didn’t do that you absolutely love? What models do you geek out over? AB: Has there ever been a CG creation that you saw in a t.v. show or film that you thought to yourself upon seeing it, “I could’ve done that as a model.”? MB: Yes. The New Battlestar Galactica. Indeed it’s one of the very few CGI ships I nearly thought WAS a model. I love it, but (dare I say it) detest the original which you could literally see submarine kits stuck to the side of. It was just a mess (to me personally – I stress). AB: What’s the strangest thing you ever been requested to create? MB: A pair of full-size 14th Century horse saddles made of wood and leather for the BBC TV series “Connections”! AB: I know you work mostly in Europe, and forgive my ignorance here. But have you ever worked on anything in America? If so, how was the experience different from working in London or France? MB: Yes, especially more recently. There’s one problem though, if I tell you what it is I’ll have to shoot you as I’ve signed these secrecy contracts/clauses for all 3 things I’ve done, and they really sew you up tight. The biggest difference is the fact that firstly I was really genuinely taken aback by how many people knew who I was. Also the fact that while working in L.A, I was given A WHOLE HOUSE with a swimming pool and everything to use as I wanted. They even flew my wife and younger daughter over to see me and my daughter STILL can’t get over having a stretch Limo waiting for her at the airport! Here in the UK nobody seems to give a fig who you are, or what you’ve done. Also people in the States welcome drive and vision and talent. In the UK they’re mostly (not always) but mostly jealous, and will resort to surprising lengths to “bring you down if they can”. Very sad. Certain parts of the British film industry are their own worst enemies, and nepotism is rife! AB: Generic question alert. Do you find that the community of model-makers is growing, staying about the same, or decreasing? MB: That’s really hard to answer as I tend, when in the UK, to work alone, or have done for much of the past 20 years. I do get lots of would-be modelers asking me for jobs, especially with the advent of e-mail, but it seems to have always been about the same: far more potential model makers asking me for jobs than I can possibly take on. AB: Fill us in on what you’re up to lately with your work, and talk about your magazine. I know it’s been a labor (labour, says Martin) of love, tell me why. MB: Most recently I seem to have been approached by many really serios collectors who want models of their favourite spacecraft, or vehicle, or even robot (!) to sit on their desks. I’m not talking about a few weeks work here either. I’m talking about paying me to work FOR A YEAR on a model they just want to look at. I recently was asked to make a 5 foot long replica of the “Enterprise E” from “Star Trek” with ALL the lights working, every single panel line in the right place, EXACT replicas regardless of cost. AB: I’d kill for an exact replica of the NCC 1701-D, and if I was rich, I too would likely present you with such a request. Anyway, how’s the reaction been to the new magazine, and does that reaction indicate anything to you about people’s hunger for practical effects? MB: The magazine has only had one issue out so far so it’s a bit hard to tell, but it’s gone to a third printing, so that’s a good sign! At the moment it’s only a quarterly publication, but it’s essentially for the modeler who really wants to know EXACTLY how it’s done, right down to the last rivet. It has also sent people running to their computers with the result I had around 30 e-mails in the first few weeks after it came out. Many said how they rued the day models stopped being used in films, and ALL of them were complimentary and said how long it was they had waited to hear from me about how I’d made the models, particularly for shows like “SPACE 1999” (the first show I ever worked on). It seems there are all these “forums” out there that I was totally unaware of that will discuss, and argue, about a SINGLE kit piece I may or may not have used on a model I built in 1968. I should point out for those that don’t know, that when I went to try and get a job on “SPACE 1999” I took a model of a spacecraft I’d built in 1968 after seeing, and being extremely inspired by the late, great Stanley Kubrick’s “2001: A Space Odyssey”. This model ended up being bought by the SFX supervisor, Brian Johnson, and appeared in various forms in 5 episodes of the show! MB: Well, they say you can’t please all the people all of the time, and some people I ask say they want a book like the magazine, going into minute detail about how this or that was done. However, my idea was to do a “coffee table” style of book, that just has a load of really good photographs in it and a small amount of text relating to various aspects of my modeling and photography in general. I can’t see the point of doing it like the magazine twice. MB: I suppose I have always thought of my models as pieces of art. That’s one of the real reasons I got into 3D construction as soon as I did. It’s also why I can’t conceive of ever building a model on a computer. I like the feel of the wood, the clay under my finger nails. I like to carve a shape, stand back and look at it, and if it’s right then fine. If it’s not then I can change it. People are always asking for copies of plans of my models so they can build them. The truth is I DON’T HAVE ANY! I have a few quick sketches, but first and foremost, I’m a 3D artist who just happens to like creating film miniatures. 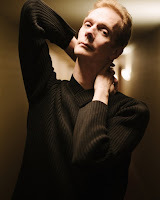 *All photos appear courtesy of and with permission from Martin Bower.